Burglary suspect sought – Welcome to Wyandotte Daily! Bonner Springs authorities are seeking a suspect in a burglary on March 15 at Advance America, 608 Tulip. More than $1,300 was taken. According to authorities: A clerk was on duty when the suspect entered the business and inquired about a title loan. The clerk was assisting another customer and was told the business does not do title loans, and the suspect left. 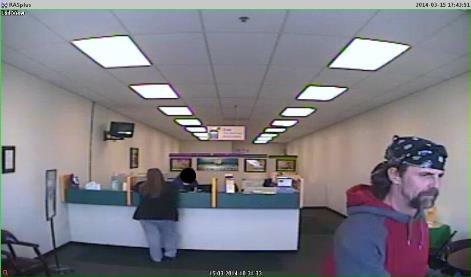 The suspect returned around 2:50 p.m. and inquired about a payday loan. No one else was in the business except the clerk. The clerk told him due to verification requirements the loan would not be available until Monday. The suspect then pulled out a long barrel and told her he was sorry. The suspect told her to lock the front door, which she did. He told her to take him to the safe, which she did. The suspect told her to open the safe, which she did. He removed the money. The suspect told her to go the bathroom and count to 60. If she left the bathroom before counting to 60 she would be shot. Throughout this ordeal the victim was in fear of her life and thought she was going to be killed. The victim was not harmed. Anyone with information should call the Tips Hotline at 816-474-TIPS.